James J. Welch & Co., Inc., based in Salem, Mass., faces a penalty of $28,125 for allegedly violating a requirement designed to protect children from exposure to lead-based paint during painting and other renovation activities. The alleged violations occurred during a renovation project at the former Frisbee School in Kittery, Maine, at which JJ Welch was the primary contractor. The Kittery site was, at the time of the renovation, a child-occupied facility subject to EPA’s Renovation, Repair and Painting (RRP) Rule. The violation was brought to EPA’s attention via an anonymous tip, after which EPA and Maine Dept. of Environmental Protection performed an inspection of the site in Feb. 2012. Based on the inspection, EPA determined that JJ Welch did not ensure that a company hired as a subcontractor to replace windows at the school complied with the required work practice requirements of the RRP Rule, including failure to assign a certified renovator to the work site; failure to cover ground with plastic sheeting; and failure to contain waste from the renovation activity. EPA’s RRP Rule is designed to prevent exposure to lead-based paint and/or lead-based paint hazards. The rule requires individuals performing renovations for compensation at most pre-1978 housing and child-occupied facilities to be properly trained. There are certification and training requirements for individual renovators and firms performing renovations to ensure that safe work practices are followed during renovations. The rule became effective on April 22, 2010 and allows for the assessment of penalties that may reach up to a maximum of $37,500 per violation per day. Infants and young children are especially vulnerable to lead paint exposure, which can cause developmental impairment, reading and learning disabilities, impaired hearing, reduced attention span, hyperactivity and behavioral problems. Adults with high lead levels can suffer difficulties during pregnancy, high blood pressure, nerve disorders, memory problems and muscle and joint pain. 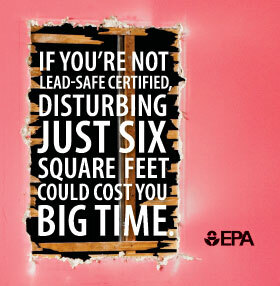 Are you EPA Lead Certified? If not, Arthur Gary School of Real Estate offers two EPA Lead Renovation Certification courses this September! « Sales Agent Candidates–Don’t be confused!